This book represents the first full-length scholarly study of F. W. Ferling’s (1796-1874) 48 Studies for Oboe. 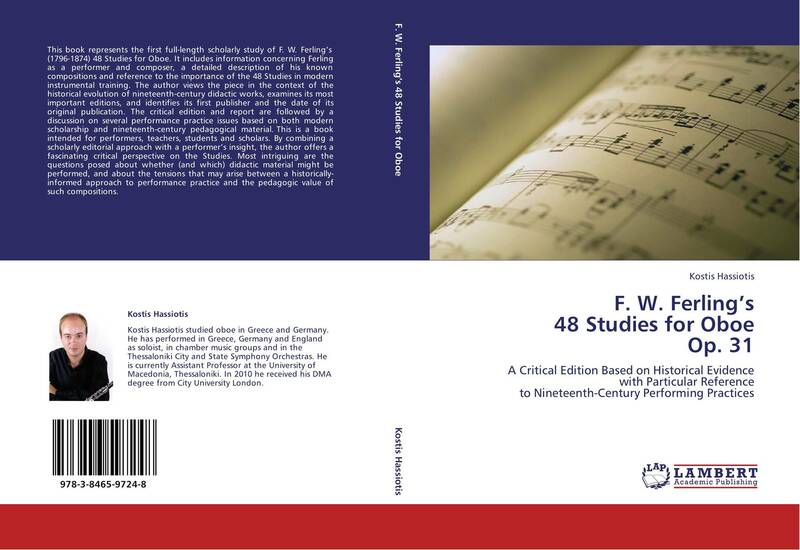 It includes information concerning Ferling as a performer and composer, a detailed description of his known compositions and reference to the importance of the 48 Studies in modern instrumental training. The author views the piece in the context of the historical evolution of nineteenth-century didactic works, examines its most important editions, and identifies its first publisher and the date of its original publication. The critical edition and report are followed by a discussion on several performance practice issues based on both modern scholarship and nineteenth-century pedagogical material. This is a book intended for performers, teachers, students and scholars. By combining a scholarly editorial approach with a performer’s insight, the author offers a fascinating critical perspective on the Studies. Most intriguing are the questions posed about whether (and which) didactic material might be performed, and about the tensions that may arise between a historically-informed approach to performance practice and the pedagogic value of such compositions.